Our 2018 Annual Report is now available. 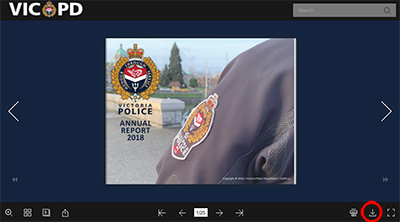 Featuring highlights from each division in the Department, the Annual Report is a summary of our work in keeping Victoria and Esquimalt safe for 2018. In efforts to reduce costs and environmental impacts, we’re releasing this report in a an online, digital version. This digital version of the report in “flipbook format” is embedded below. For a printable, PDF version of the report, please follow the instructions below. To download a printable PDF version of one of our “flipbook format” documents.